Jesus is seeking you out for a relationship, he comes to where you are to meet you. Jesus did not have to go through Samaria, in fact most Jews would take the long way round to avoid it, such was the hatred between the two races. Jesus has a God appointment to keep. As the Samaritan woman comes to the well to draw water, Jesus approaches her. He breaks the rules of society three fold, approaching a Samaritan, a woman and one of ill repute. She even reminds him of those rules just in case he wasn't aware, but he ignores her and offers her 'living water', a new life. What is socially acceptable does not matter to Jesus, offering the gift overrides every social situation. In fact he tells her that if she knew what he was offering she would have asked him! Being in relationship with God will mean breaking the social rules. You might worry about offering the living water of Christ to people by telling them about Jesus but, actually if they knew the gift they would want it. It doesn't mean you won’t be rejected but there are some people who do not know that it is available to them. Jesus doesn't just hand out this gift of new life, first he opens her eyes to the life she is living. He doesn't accuse or condemn her, but gets her to talk about her own life and then leaves her to ponder it. How can you accept a new life if you don't understand and face the one you are living? Only when you understand and accept the gift you have been offered, can you offer it to others in need. Jesus turned this woman's life around and then turned her into a witness. She went into town to tell the others about her encounter with Jesus. In the same way you can help others to look at their lives being careful not to accuse; you are helping people to become self aware, not telling them where you think they are going wrong. Your life and past may make you feel unworthy and unapproachable, but Jesus seeks you out. He placed people along side you, that love and accept you when it seems no-one else will. He is offering you the gift of new life, wherever you are or have been, don’t be afraid to face your life. Jesus will be with you at every step guiding you into a new life with him. Lord, I thank you that you see my whole life and still love and accept me. 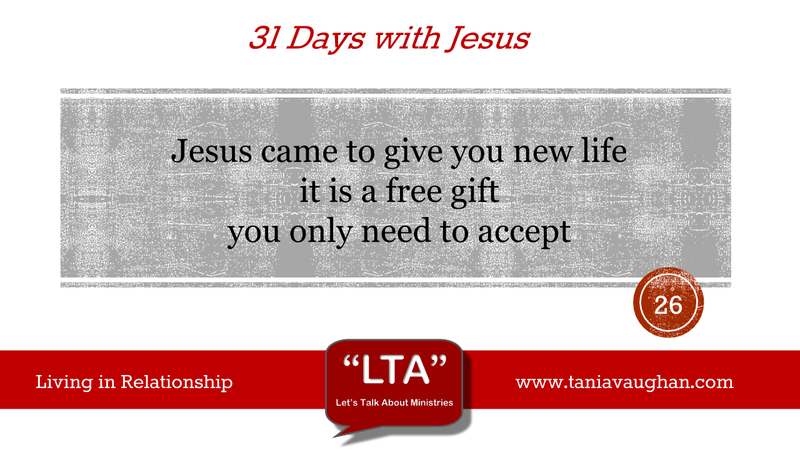 No matter how unworthy I feel you offer me this free gift of new life. Thank you that seek me out to draw me into a relationship with you. Today, Lord I say yes to putting off my old life and ways and accepting the gift of new life that you give me. Jesus was never one to bow down to social customs or traditions. JC didn't see a samarian but a woman in need of salvation. We, me included, judge all too quickly and all too often on outward appearances. But here (yet again) we see JC looking inside the tin rather than just relying on what is written on the label - how many times have you walked into church and are asked 'how are you?' You reply 'I'm fine' or 'I'm doing good!' When you are broken, near exhaustion and crying out for a friend! God sees exactly what is written on the - inside - of the tin! JC gives this woman a beautiful gift and she recognises it for what it is - Love, salvation, redemption, forgiveness - its all these things but I think its grace too! The amazing thing is she runs and shares her testamony with the village and many are saved. I remember a song from school assembly and the lyrics are something like this. 'Love is like a magic penny, hold it tight and you won't have any. Spend it, lend it and you'll have so many they'll all roll over the floor!' I was 7 years old when I learnt that - are we spending God's love as JC would wish today?